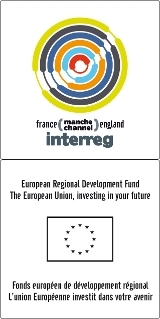 The project has been selected within the scope of the INTERREG IV A France (Channel) – England cross-border European cooperation programme, co-financed by the ERDF. The English Channel and the southern North Sea, have, for long, been supporting a range of human activities (fisheries, tourism and leisure, marine aggregate extraction, maritime traffic, international ports and shipping, estuaries, offshore windfarms…) of great economic importance and subjected to multiple user groups who often have conflicting stakes. Despite these pressures, natural resources (fisheries, shellfish, but also minerals) available in these zones remain very prized, at national and European levels. Stakeholders’ (e.g. EU and its member states, regional councils, fishermen, industries, NGOs, …) demands in terms of understanding the responses of the marine ecosystem and its resources to various pressures, including that of climatic change, is acute and continues to intensify. A deeper understanding of this maritime area is hence needed so as to preserve this fragile marine ecosystem, which is subjected to strong human pressures. It is moreover essential that neighbouring countries share a common vision of the management of this ecosystem for the long-term sustainability of its resources. Hence, an ecosystem-based approach of marine resources management requires the synthesis of existing scientific knowledge and its integration to new research; such an approach will help improving the quality of management and planning advice that is given to decision-makers. In this context, the Interreg IIIA CHARM projects (phases 1 & 2 – 2003/2009) represented a first multidisciplinary approach in this maritime area through an innovative approach to spatial ecosystem modelling. They resulted in an assessment of key marine species and their habitats in the Eastern Channel, followed by the development of prototype management tools able to predict various current and future human impacts in this area. Building on the results obtained during the preceding phases, the objective of CHARM phase 3 is to accentuate the multidisciplinary nature of the works accomplished through an ecosystemic approach, i.e. an "integrated" approach of the management of marine resources (living, mineral, human). As a result, the study area will be extended to the whole of the English Channel and the south of the North Sea and new expertises (e.g. economy, climatechange) will be introduced in the CHARM team. The project will make a direct contribution to the specific objective 10 of priority 4. A total of 17 main actions are envisaged, which can be grouped under three main priorities: (i) Collection & standardisation of information, (ii) Information integration and (iii) Tools & information dispersal. The expertises involved range from marine sciences (e.g., oceanography, marine biology, fishery science), economy, legislation, geography (e.g. cartography, spatial analysis, Geographical Information Systems), statistics (e.g., ecosystem and trophic network modelling), planning (e.g., marine spatial planning), information technology (e.g., Internet technologies, programming). Many of these expertises are of inter-disciplinary nature, a requirement for any integrated approach.